Kate is a woman who knows what she wants and makes sure that she gets it. Life did not always treat Kate with kindness. She was beaten by Curtis Reed, her ex-husband. Kate did what she thought was the best thing and got away from him. Curtis lied to her and told her that Austin and Billie died. Kate wanted happiness, even if it was with a married man. 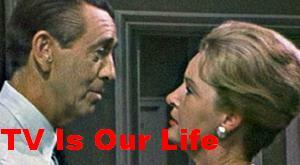 She had an affair with Bill Horton and became pregnant with Lucas. This is a mother who will do anything for her kids. To survive, Kate became a call-girl. Later, she learned the truth about Austin and Billie. She struggled at first to re-connect with Billie but all was forgiven. Finally, she met Victor, a man who could give her the moon and the stars. Kate felt wanted and, I think, for the first time, she felt safe with a man who cared about her. The relationship also meant wealth. However, her happiness did not last long as Vivian tried everything in her power to get rid of Kate. She finally did so when she drugged Kate's pilot and the plane crashed. A fishing boat picked her up and she lived for almost a year on the boat. We all know how determined this woman can be and that she is a survivor. Kate finally made it back to Salem and reclaimed her life and her man. Kate and Victor had a son, Phillip. Victor had two strokes and was placed in a nursing home. This meant that Kate was the lady of the house and took over Titan. Soon Kate became enemies with Sami Brady. Sami blackmailed Kate with her past. We all know that when Kate gets mad, she gets even and will do anything in her power to save her family and her own skin. When Lucas shot Franco, Kate did not hesitate to frame Sami for the murder. This just showed us, once again, that she will do anything for her children, as she framed Sami to protect Lucas. Kate is a woman who will use anyone to get what she wants. She even used her own grandson to try to push Sami over the edge. Later on, when Victor recovered, he kicked her out. This meant no more nice clothes, money, and status. Kate tried to kill Victor on two occasions: first in Paris and once again in Salem when she hit him over the head and set the Kiriakis mansion on fire, unaware that Lucas was in the house. Here we got to see Kate repentant for what she did. We were shown how manipulative she can be when she used her own son, Phillip, to get what she wanted. She played on Phillip’s emotions and knew how he would react to her working in a diner as a waitress. By manipulating her son, she got exactly what she wanted. Kate lied when she applied for a position at Basic Black because she is a determined woman and will not let anything get her down. Kate found love again with Roman. I think this was the second time in her life that she felt loved and wanted and not used. She and Roman finally got married, but the wedding night turned into tragedy when Roman was killed by the Salem Stalker. It must have ripped her apart to find her new husband dead. Kate knows how to use her beauty to get what she wants, but one thing we can say for her is that when she truly cares about someone, she will do anything for that person, even if it means hurting the people close to her.